High Momentum or Mean Reversion? A long, long time ago, back in the 1990s, we had a method called “High-Momentum Trading.” It was a short-term strategy that took advantage of overbought and oversold conditions – not by fading them (selling overbought and buying oversold values), but by buying overbought and selling oversold situations. It does seem contrary to the concept of being overbought or oversold, but it’s all about timing. Rather than use a standard momentum indicator, such as an RSI, MACD, or stochastic, we’ll look at sequences of up and down moves. One of my favorite systems is the 3-day pattern, which works well for equity index markets because they have a history of being noisy. That is, they don’t often continue in the same direction for more than 3 days without reversing. Yes, sometimes they continue longer, but this is all about numbers. 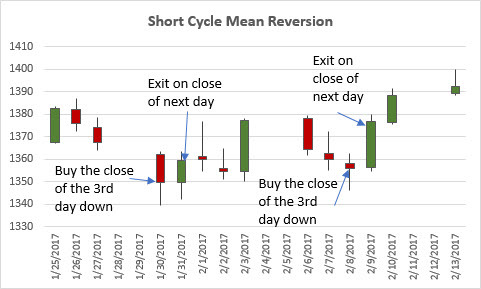 In the classic pattern trade, which I call a “Short Cycle,” you wait for two down days then buy the close of the third day down (see the Figure below). You hold for a profit target, based on a 20-day average true range, or exit on the next close. The trade is held no longer than one day. That approach is mean reversion, and works for both long and short sales, but makes much more on the long side, which should not be a surprise. It does even better if you filter it with a long-term trend, although that reduces the number of trades and increases the correlation to other trend systems. It’s a simple method, but you’ll need to decide on the length of the trend and profit-taking factor. Profit-taking is important for short-term trading, so you want to capture profits often. The point of reviewing this mean-reversion, short-cycle trade is that the equity markets are noisy and the best short-term trades are counter to the current price move. Then it becomes more interesting that the VIX, the options volatility index based on the S&P, does the opposite. For this high-momentum strategy, we can use the same basic set-up, two days down as a trigger, but instead of buying the following close, we sell a lower open or sell a lower close, whichever comes first (if at all). Again, we use profit-taking on the first day if we sell the open, and on the second day if we are still holding the trade or entered on the previous close. 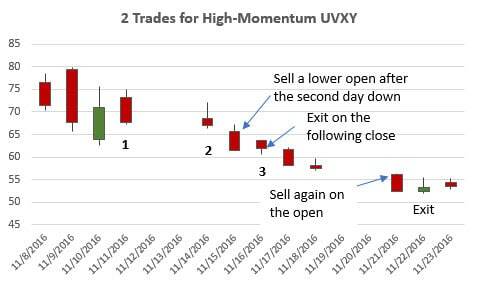 We use the EFT UVXY for both longs and shorts, but for the volatility index, profits from short sales overwhelm gains from longs. That’s probably why most professionals sell volatility. I’m not going to show you the results of either of these strategies for two reasons. First, you now have all the rules for implementing this yourself. It’s always best that you test any strategy to be sure it actually works. When you do that, and you are successful, you will be more inclined to trade it. Second, a more detailed article about these two methods will appear in Technical Analysis & Stocks and Commodities in a few months. This way you have a head start! We’ll let you know what issue.